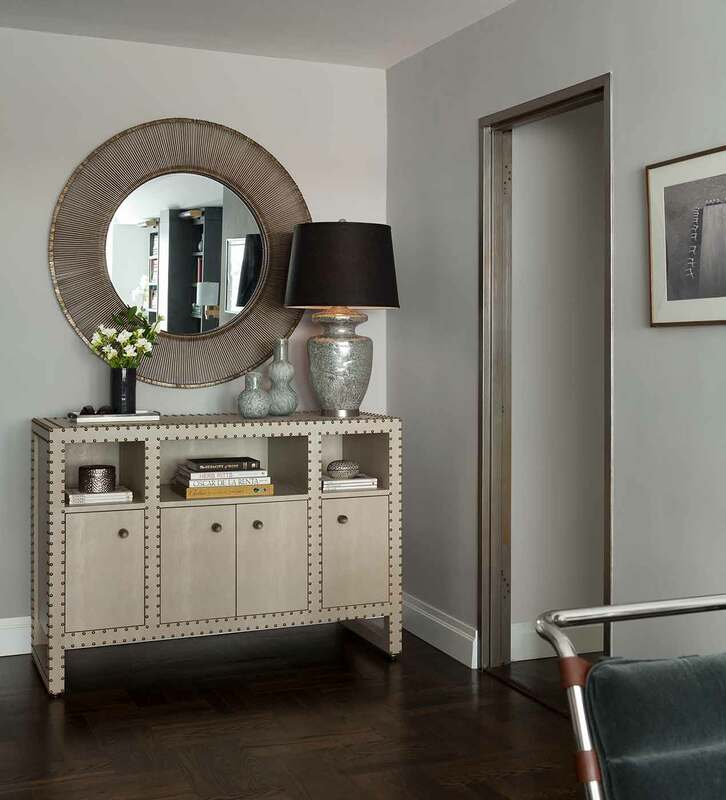 a fashionable address since the 1920’s, sutton place has been known for its upscale apartments for almost 100 years. 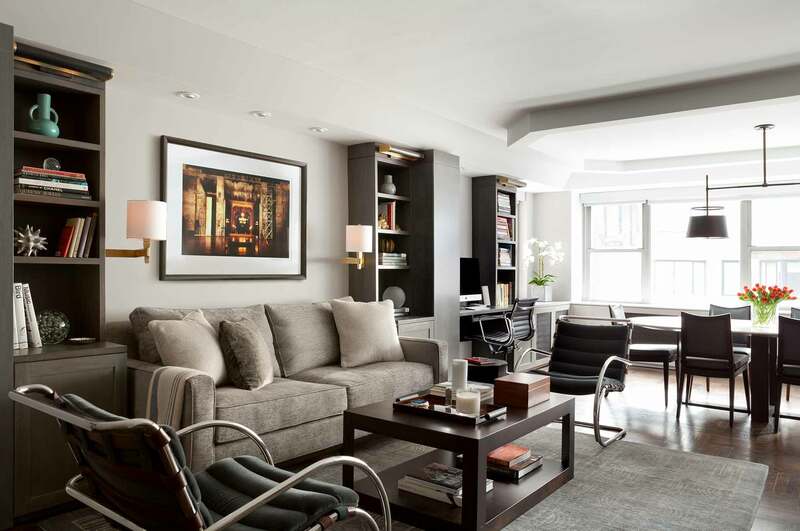 former residents include everyone from bill blass to c.z. guest to elsie de wolfe. 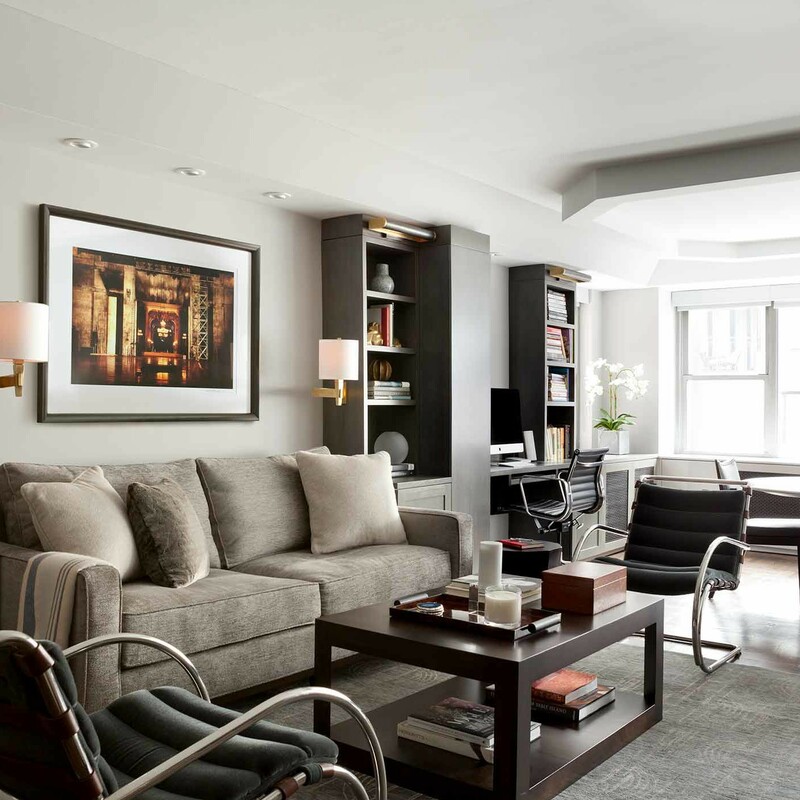 our clients, quintessential new yorkers by all accounts, had lived in the space for more than 30 years and they were ready for a serious update! 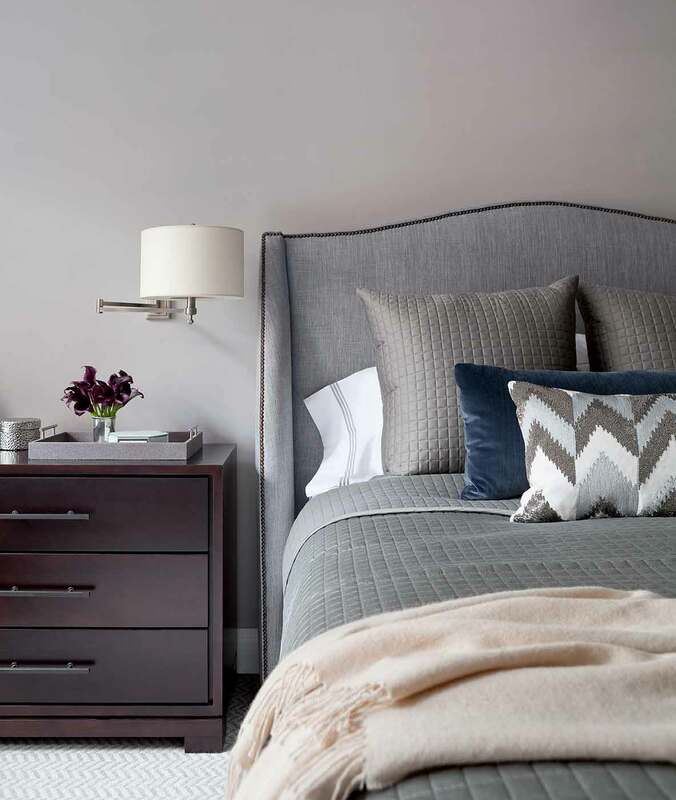 they wanted a comfortable, contemporary vibe and we couldn’t wait to get started. 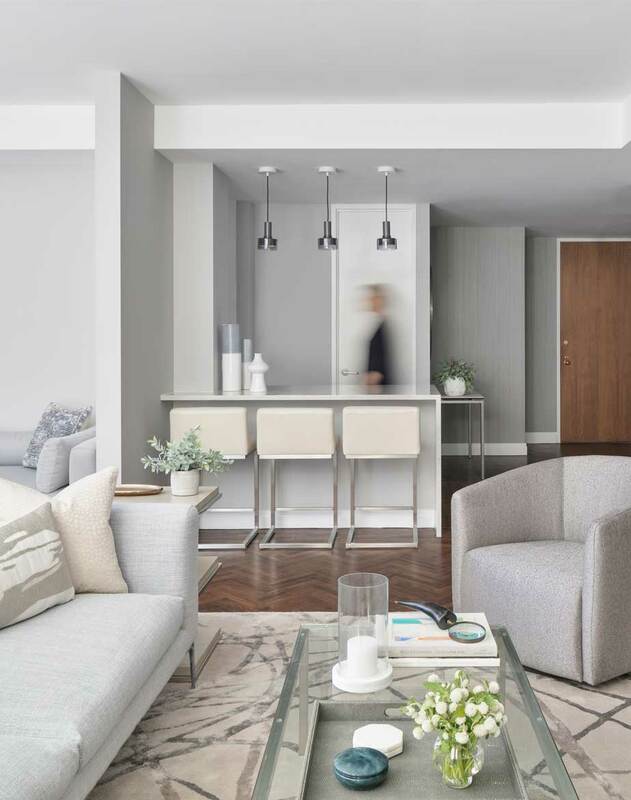 at darci hether new york, we are firm believers in the transformational quality of design and this project is a prime example. 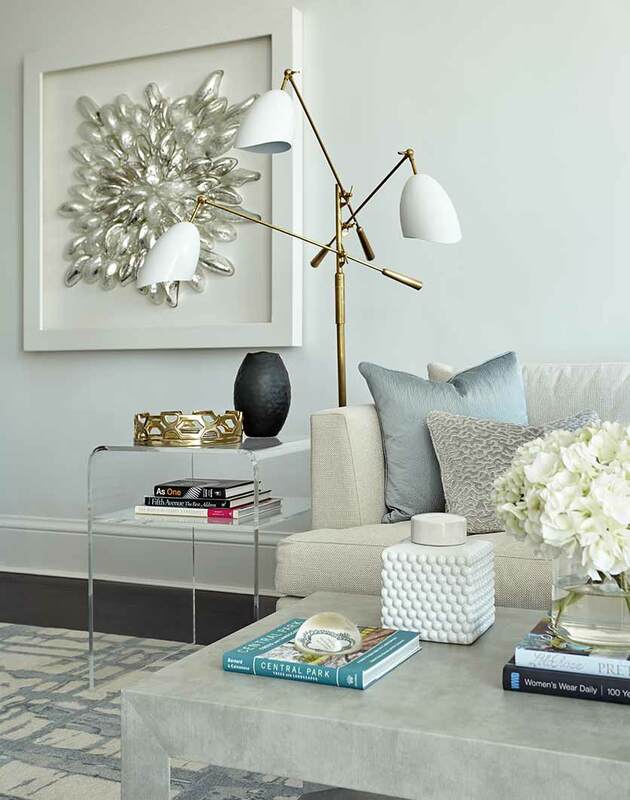 what began as a dimly lit apartment with wall-to-wall carpeting became the light and airy abode you see here. 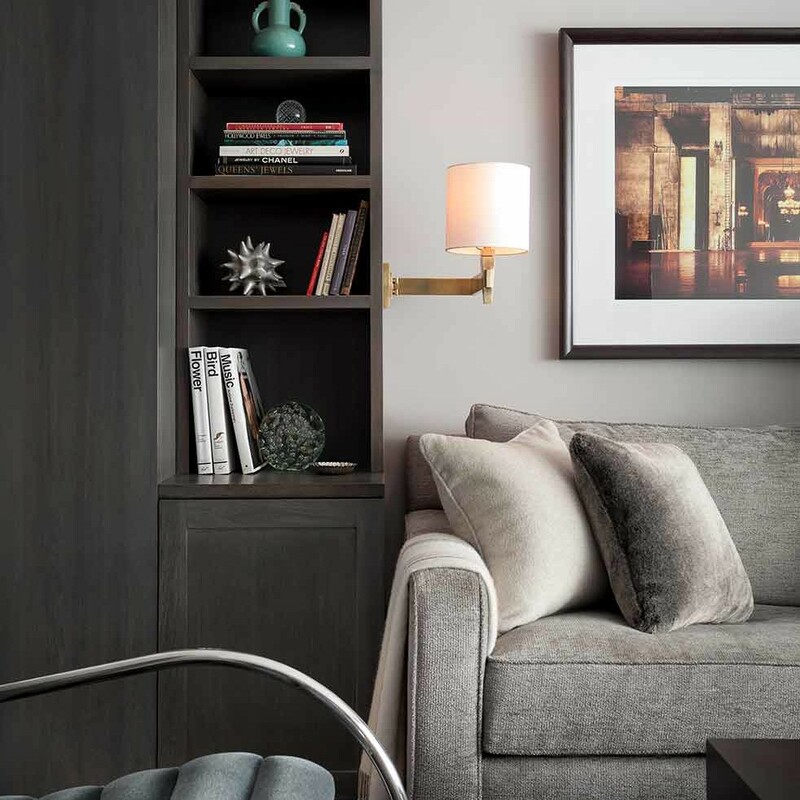 we selected clean, modern elements, rich textures, and a few carefully selected mid-century nods to create a space that begs to be lived in. for this open concept project, we tackled the living room with adjacent office space, the open concept living/dining area, and the bedroom. broadloom carpet, which once occupied each of those spaces, was ripped up to reveal gorgeous existing hardwoods. since they had been covered for more than 30 years, they were in great condition. we sanded and re-stained them, making the most of what was truly a gift from the design gods! 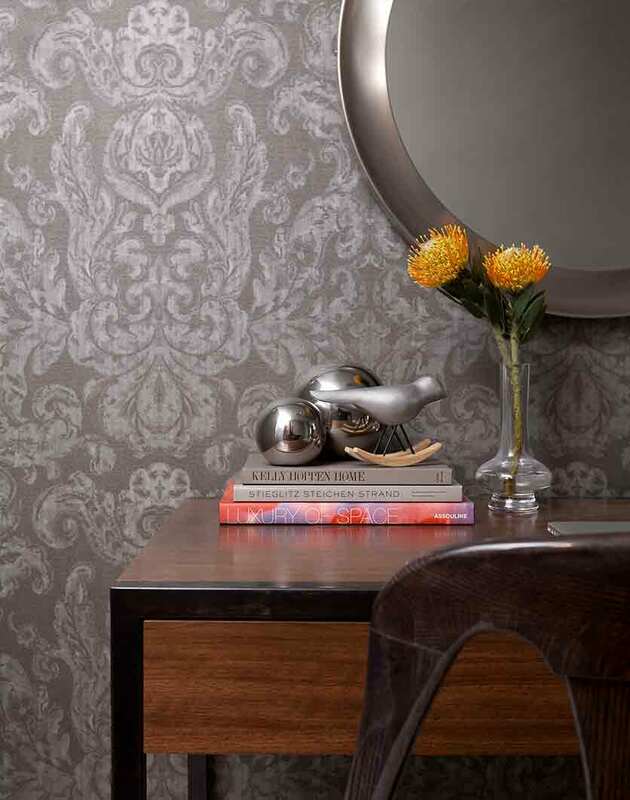 trying to brighten a dark room — or an entire apartment for that matter — posed its own unique set of challenges. thankfully, we’re experts in this arena. the apartment building faced south and there was a fairly large building across the street, so we were starting at a disadvantage. we made the most of existing light sources and added more whenever possible. five sconces and dropdown soffits were installed in the living/office area alone. 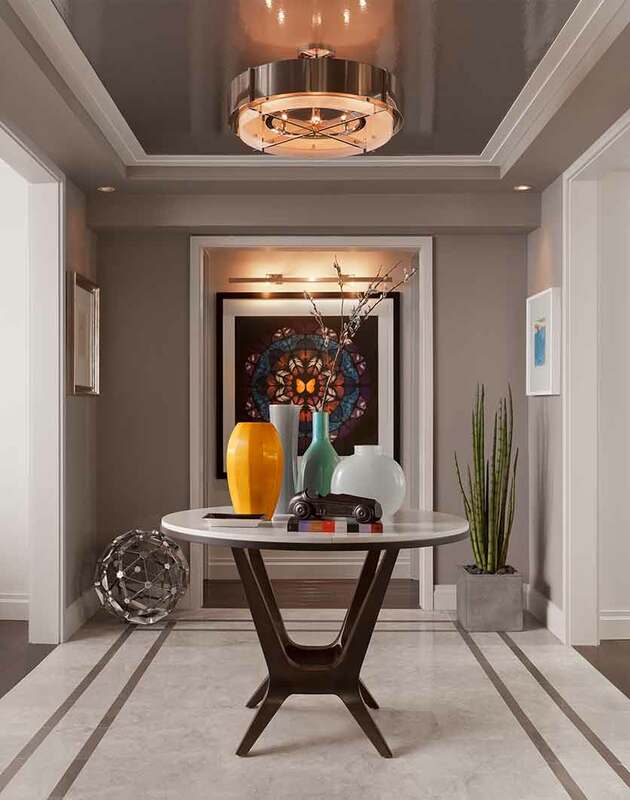 in the dining room we created a soffited ceiling in an octagon shape with a lowered center portion. 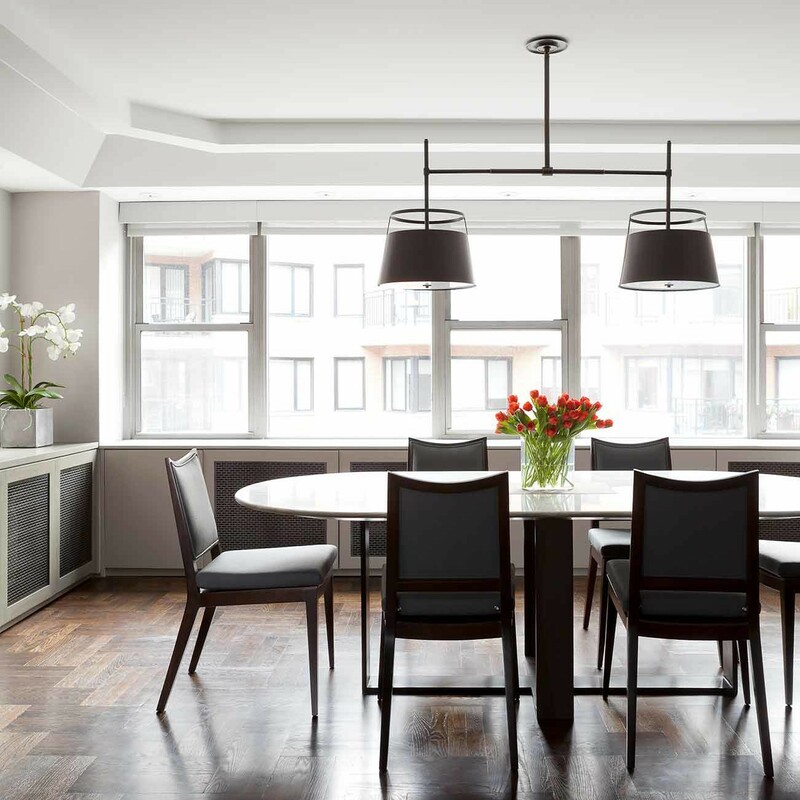 this allowed us to re-center the dining pendant, making the overall space feel more centered, and also added visual interest. the fixture we selected for above the table was chosen for its sophistication and efficiency — each of the tailored pendants accommodates two bulbs. 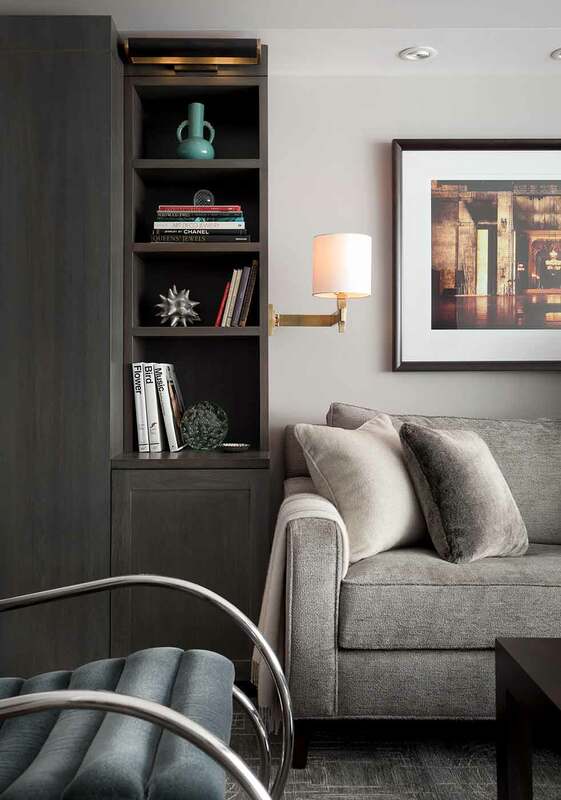 as far as existing elements, our clients had a boatload of beautiful coffee table books that they wanted to showcase, as well as cookbooks and trinkets from their travels. 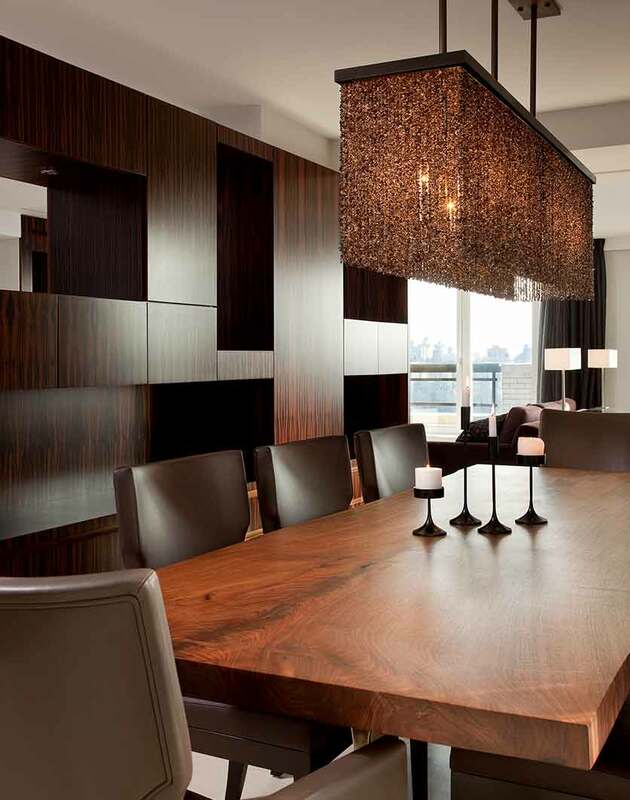 our team rehomed these items in stunning custom millwork sporting straight lines and, of course, well-placed lighting. 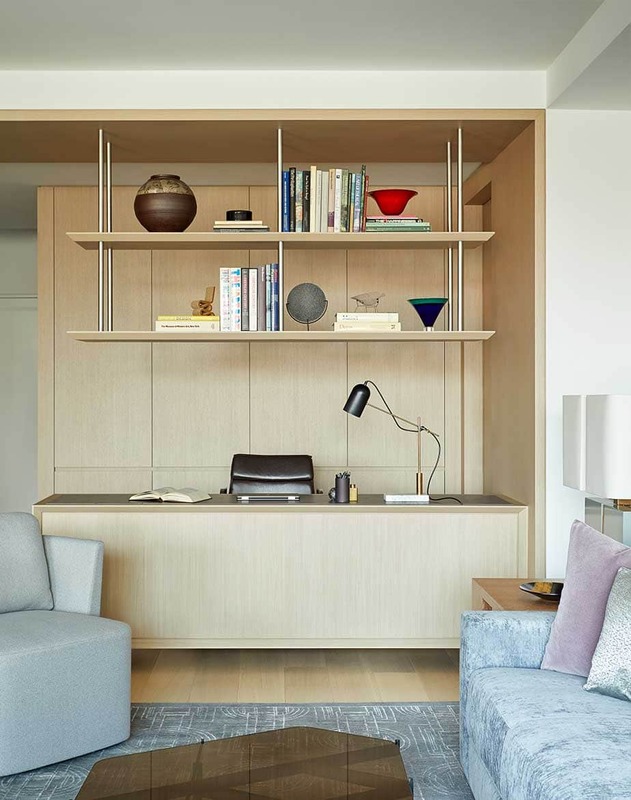 custom millwork was also used to create a desk and wall-to-wall cabinets. not only did the millwork delineate the dining space, it also camouflaged the existing radiators. decorative metal grilles were placed over the radiator grates to add visual interest and allow for airflow. 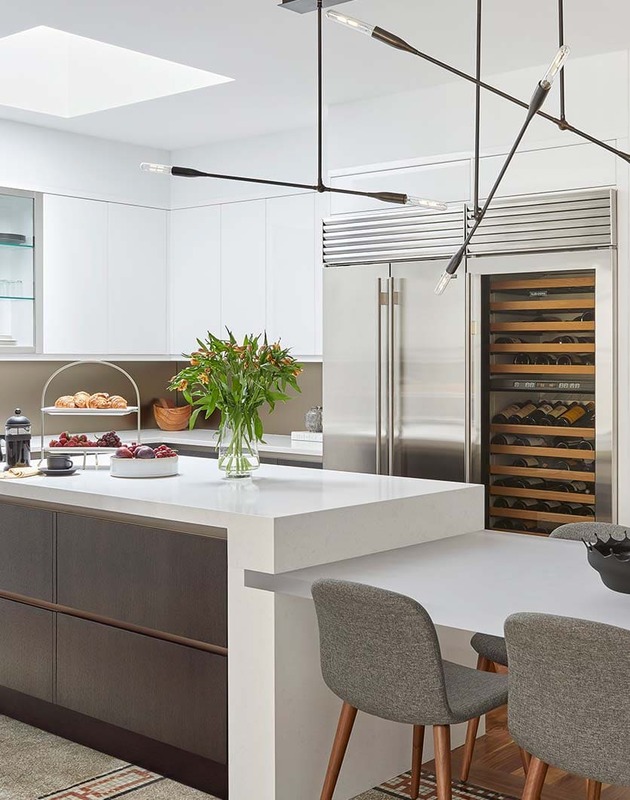 maximizing the functionality of the millwork, the length of those cabinets also acted as a serving space. 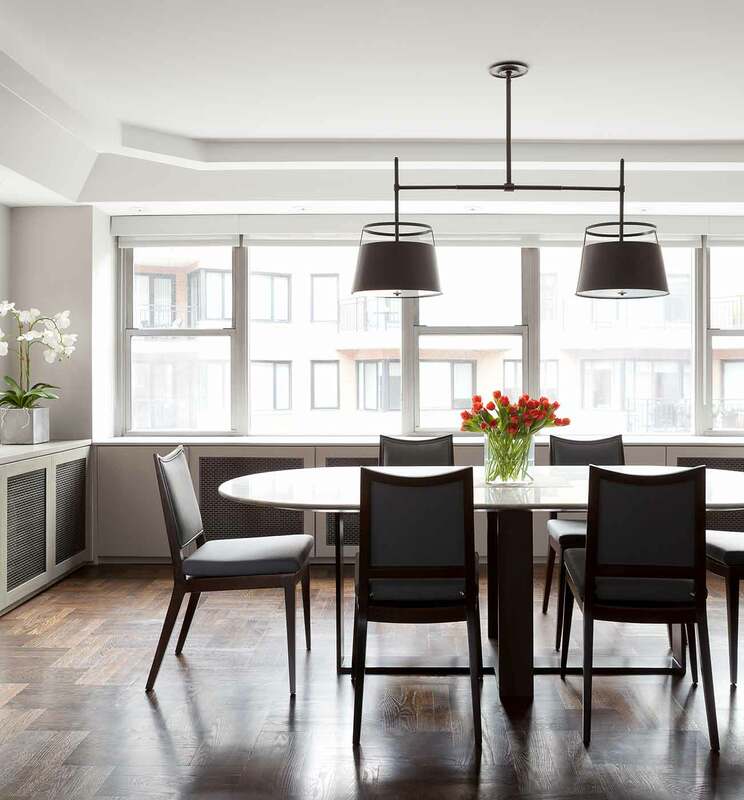 other existing pieces — like a pair of mies van der rohe chairs and a marble dining tabletop with racetrack design — were updated to give them new life in the freshly renovated space. 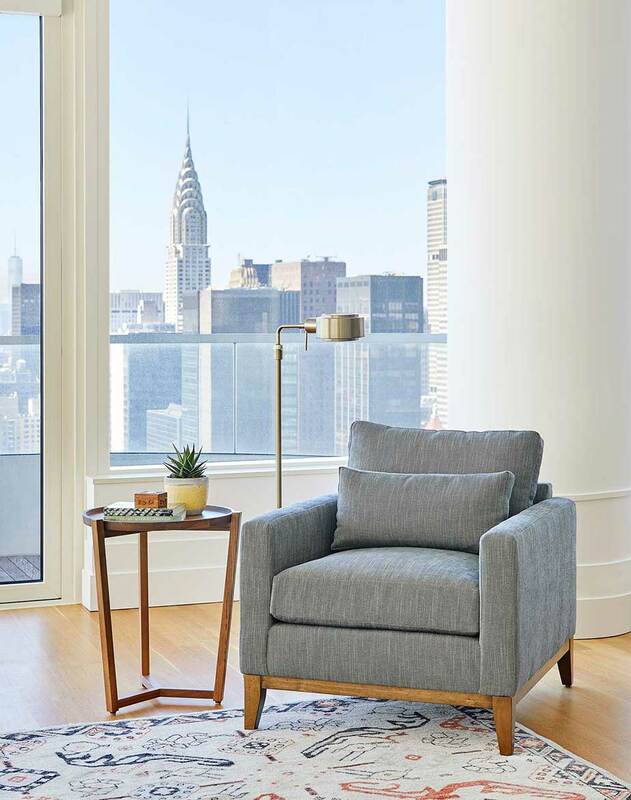 the mies van der rohe chairs were reupholstered in deliciously rich grey mohair and the tabletop now sports a brand new custom steel base. 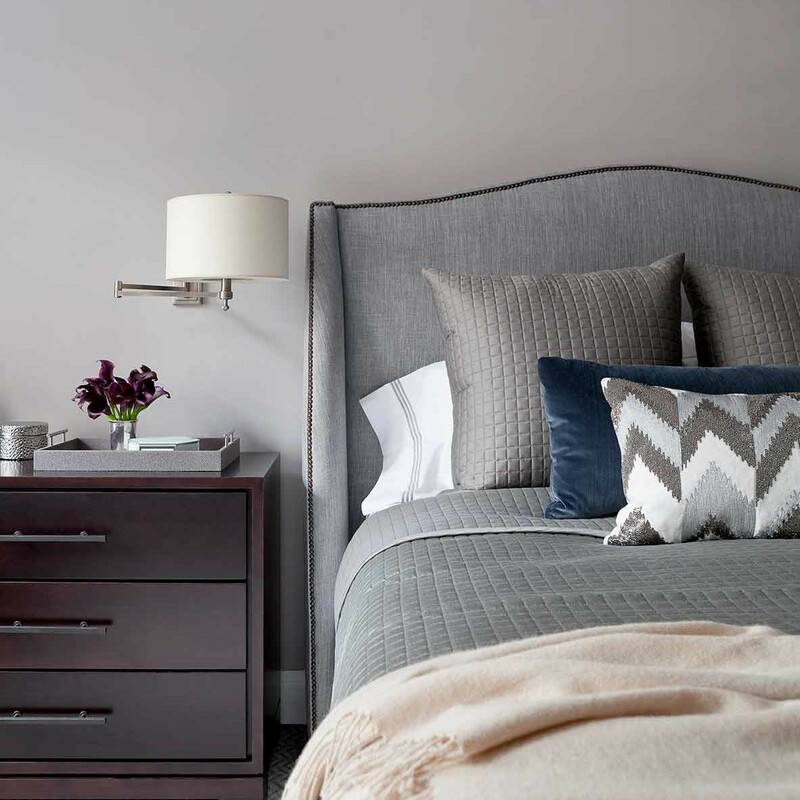 the couple’s bedroom received brand new wall-to-wall carpet, a custom bed and oversized beside tables for additional storage. 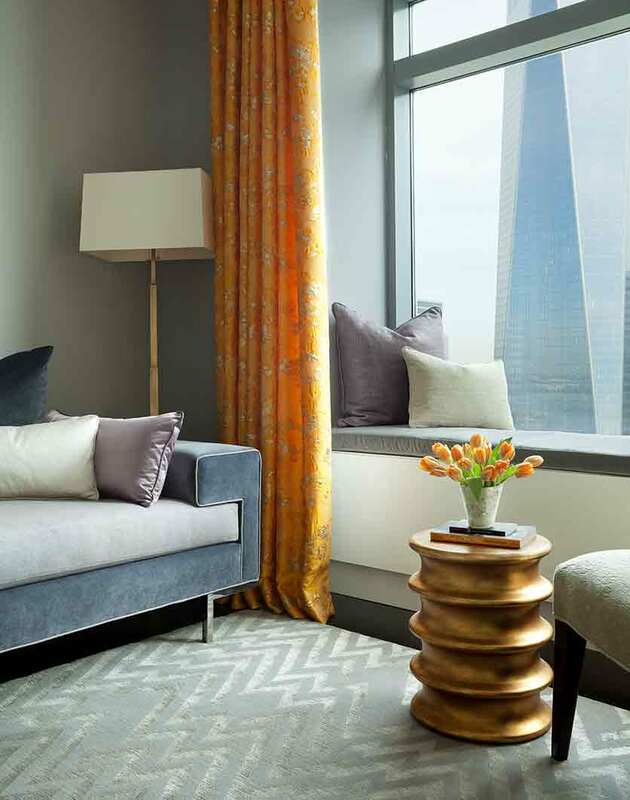 lush textiles in neutral tones made the space the perfect place to land after a long day running around the city. for the entry area, the couple really wanted a defined drop zone. the cabinet we added serves as home to seasonal accessories as well as an open surface for their keys, mail, and miscellaneous odds and ends. 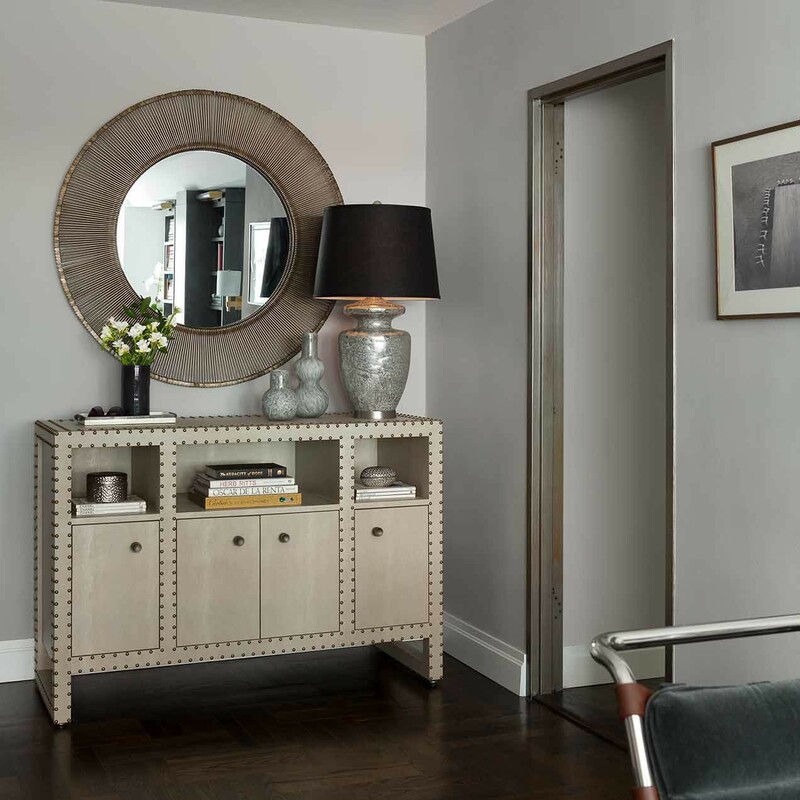 a large, round wall mirror adds style and offers an opportunity for last-looks as they head out the door and into the bustling city streets.